Since the introduction of the LDP Class to, they have been a staple of the QRNational freight trains running between Brisbane and Melbourne. Running in pairs, the LDP Class dominate the running of the MB7/BM7 freight services, with the occasional G, CLP, X, 421 or 422 class along for the ride (usually being transferred to or from maintenance, or swapping the shunt locomotive at a particular location). However, a new TOC waiver published by RailCorp in June 2010 lays down new rules for the operation of AC locomotives like the LDP (and SCT) classes. Among other specifications, it includes a line that AC type locomotives may not be powering in a consist that includes older DC drive locomotives. This means that when there is a shortage of an LDP Class, another locomotive class cannot just “step in”. QRNationals G534 combines with G516, X54 and LDP001 (dead attached) to haul 7MB7 QRNational freight to Brisbane, seen here passing through Macarthur. 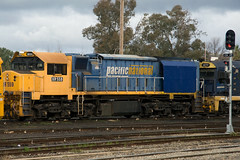 As QRNational has nine LDP Class on long-term lease from Downer EDI’s leasing division – Locomotive Demand Power (hence the name of the class), which is normally enough to run their four weekly services in each direction – usually with two LDP Class per train, this allows for units to be maintained without leaving a deficit. Recently, QRNational began running services in each direction five days a week, leaving Melbourne and Acacia Ridge on Saturdays, Mondays, Tuesdays, Wednesdays and Thursdays. This had stretched the LDP class fleet somewhat, and led to the re-introduction of G Class on selected east coast trains (since the introduction of the LDP Class, G Class were placed on east-west running with the operational CLF and CLP class). The QRN X Class were also used on occasion to supplement the LDP Class during this period. Since the start of June, a number of LDP Class have been introduced on QRNationals east-west services, to supplement the 6000 Class being used on those trains (currently the 6000 class are used with the G/CLF/CLP class). This is due to the LDP Class having inline fuelling, avoiding the train having to stop for fuel on the busy Adelaide to Perth line. With the LDP Class unable to operate in multiple with the older locomotives within the RailCorp area, this has led to a return of pre-LDP Class operation to a number of QRNational services between Melbourne and Brisbane. This would indicate a return of the G and CLP class to east coast workings, possibly using the X and CLF class to supplement them. Previously, the two QRNational X Class were regulars on the Yennora to Glenlee shunt, usually in conjunction with one of the two QRNational owned 422 Class. With the change in motive power to Melbourne – Brisbane trains, the X Class are often used as bank engines on these trains, resulting in the transfer of 2202 from Melbourne, on hire from ARG to be used on Yennora to Glenlee shunts. X54 and 2202 work 2152 Glenlee to Yennora shunting trip on Friday, June 4th. 2202 is on hire to QRNational from ARG. The result of all this motive power change was evident in the first week of June. Wednesday June 2nd saw G534 and CLP11 work 3MB7 north to Brisbane, returning as train 5BM7 on Friday, June 4th. G534 returned north on the following Sunday with 7MB7, departing Glenlee for Brisbane behind G534, G516, X54 and LDP001, the LDP being dead attached. X54 was put onto the train in Sydney, to assist with the load to Brisbane, as per the new TOC waiver, the LDP could not operate through the RailCorp area (although it may have been used north of Broadmeadow as ARTC have not issued a similar TOC waiver). 1251 on Friday, June 4th, was operated by 2202 and X54, returning as 2152 to Yennora following 5MB7. 2152 did not run on the following Sunday, instead light engines 2202 and 42206 returned to Yennora light engine to collect 1253. Hopefully the variety will remain for a while, with the newer 6000 Class being introduced to coal haulage in the Hunter Valley, it would seem that, for now, QRNational variety has returned to east coast working. The new PPP cars are a step closer to being in service this month, as the 4-car trial set was unloaded from a ship at Port Waratah on July 29. The revenue service A-Set trains will be fixed 8-car sets, instead of the usual pair of 4-car sets that have been the norm with rolling stock orders in recent years. The 4-car test train will be used to run extensive testing, both on a special test track at EDI Cardiff, and also around the Cityrail network, testing anything from the ride quality to their performance under peak hour loads. The extensive testing is to prevent another Millennium Train debacle, as seen after their introduction in 2000, which saw them withdrawn from service until 2004. When the test train was unloaded onto the wharf, NSW Transport Minister David Campbell announced that the 626 next generation carriages would carry the name “Waratah”. 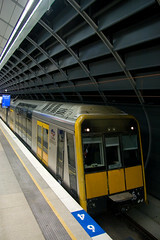 The Waratah trains are to be introduced onto the CityRail network from 2010 to 2013, replacing the R/S/L Set fleet, which was introduced to the network from 1972. From October 11, a new CityRail timetable will come into effect on all lines. 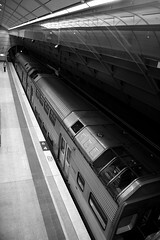 The most notable change has been on the Northern Line, which previously ran from Hornsby to the City via Strathfield. With the opening of the Epping to Chatswood Rail Link (ECRL) earlier this year, the Northern Line will now run from Hornsby to Epping, then to Chatswood and on to the City, before continuing back to Epping via Strathfield. Western, South and East Hills line commuters will benefit from additional peak hour services to relieve congestion on these lines. Additionally, new services will be introduced in the period following the morning peak hour, to assist passengers on Western, Northern, South and North Shore lines. With the continued introduction of more Outer Suburban Cars, more Tangara trains are freed up for suburban running, most notably on the peak hour Central Coast and Wollongong/Port Kembla services, which then allows more 6-car trains to be built up into 8-car trains, to ease loading on popular peak and off peak train services. The Bankstown Line is also set to benefit, with the return to a 15-minute frequency on the weekend (previously passengers on this line had a half hourly service to/from the city on weekends). On the 14th of June, Tangara set G30 was involved in crush load testing on the Epping to Chatswood Rail Link. A week later, T77 was also involved in similar testing, with an 8-car K-Set undergoing a different trial a week after T77 went through the link. G30 first ran from Hornsby to Epping, then to Chatswood through the ECRL, and then ran back to Epping via North Sydney, Central and Strathfield. After the crew changed ends at Epping, the set then ran back to Chatswood via Strathfield and Central, to run through the link again to Epping and back up to Hornsby. The train was running with a full load of “passengers”, simulated by loaded water drums to the same level that can be expected when the train is operating at peak-hour crush load. This testing was the latest in a series of tests involving the Tangara trains running on the ECRL line. Judging from the new timetable, Tangara trains will not be used on Northern Line services (all of which will run through the new link), although they are (along with the V-Set Interurban trains) permitted to work non-stop through the link under emergency conditions. The main issue with Tangara trains is their weight – the traction motors were prone to overheating on their first runs through the link during the initial testing undertaken after the link was completed. On the 27th of June, K-Set K85 and K63 were sent on a number of tests through the ECRL, although not for crush load testing (the “silver set” trains can operate normally through the link in this regard). Instead, the K-Sets were present to test the noise levels for passengers and crew travelling through the tunnels. These tests proved to be successful, and when the link is fully integrated in the 2009 timetable (see above); the Northern Line will be run by K-Set and OSCAR trains only. Incidentally, this will make it the first CityRail line to be run exclusively by air conditioned trains. In news that has dominated the rail preservation scene in NSW, P Class 3265 is the second P Class to return to steam, undergoing a number of steaming trials in July. Separate trials were undertaken to Penrith and Springwood/Valley Heights, with a pair of trials to and from Gosford undertaken in mid July. Once trials of the locomotives restoration are complete, the locomotive will be painted at Chullora Workshops (incidentally, the same location that 3801 will be receiving her overhaul). The Powerhouse Museum, who owns and operates the locomotive have opted for the locomotive to receive her “Victoria Maroon” colour scheme, which was worn by 3265 when involved in operating the Newcastle Flyer (then known as the “Newcastle Express”), around 1933. As well as the colour scheme, 3265 has had her “Hunter” nameplates returned to her (these nameplates had been removed and given to 3608 when the 36 class took over from the 32 class on Newcastle Express services). 3265 undergoing the first of her steam trails on the mainline, seen here at Sydney Terminal. 3265 is a testament to the skill and dedication of all those involved in her restoration. 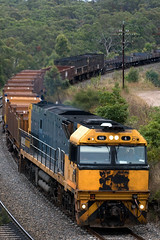 On June 27, Pacific National undertook a number of trials with their new 92 Class locomotives (built by United Goninans), as well as with a trio of LDP Class units (built by Downer EDI), to determine the locomotives suitability for use on coal trains with Southern Coal (currently the 92 Class are limited to operations in The Hunter Valley). The initial testing for the 92 Class was not successful, with the locomotives reduced to walking pace when lifting a full load of coal up Cowan Bank. The LDP Class performed marginally better, lifting the same load at a little under 20km/h. The day following the test saw the trio of 92 Class (9211, 9213 and 9208) joined by 8125 at Enfield for the run down into Wollongong. The 81 class had been added to the train to avoid any slow running on the steep grades through Como and Jannali. In a continuation of the trend to move working, surplus rolling stock from Victoria to New South Wales to assist with the movement of coal and grain (among other commodities), Pacific National transferred a number of standard gauge G, X and XR class to NSW for grain working. A number of X Class units are already employed by PN Rural and Bulk to move fuel to various depots around the state, although a couple of X Class have been sighted working domestic and export grain trains. XR555 and XR559 have been transferred to NSW to assist with the movement of domestic and export grain. A number of G Class are already in service with the Northern Coal fleet, with word that other G Class will follow from Victoria to assist with the grain haulage task in the North West of the state. Following the transfer of the contract to move export containers from Yennora to Port Botany from Interail (owned by QRNational) to P&O Trans Australia, and the purchase of 4477 and 4471 from CFCLA, POTA underwent further expansion in July, successfully winning the contract for the movement of containers from Carrington to Port Botany, resulting in the contract passing from Southern & Silverton (owned by Coote Industrial) to POTA. CLF1 and 4477 on T281 Botany to Yennora freight head into Enfield before continuing on to Yennora. 3/7/09. To assist with their motive power requirements, POTA hired CLF1, CLP11 and CLP13 (the latter two units in the corporate QRNational scheme) from Interail. By the end of July, both CLP Class units had been returned ex hire, although GM12 class locomotives GM22 and GM27 are now on lease from CFCLA, following the end of their lease to Patricks Portlink (who originally used both units on the Yennora container shuttle in 2008). POTA have also hired 44204, which has been sighted on a number of POTA trains in late July. 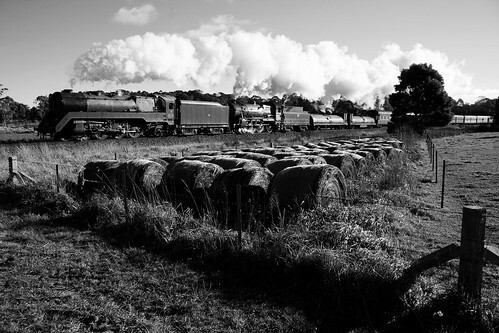 July 4th proved to be a very exciting day to be in Moss Vale (located in the NSW Southern Highlands region), with the New South Wales Rail Transport Museum running a triple headed steam special from Sydney to Moss Vale and return, running via Wollongong. 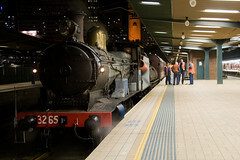 The train departed Sydney Terminal behind NN/35 Class locomotive 3526, 36 Class “Pig” 3642 and 38 Class 3830 (the latter locomotive being in the custody of The Powerhouse Museum), with 4520 and 4490 assisting from the rear. Having stormed the Illawarra Escarpment from Wollongong to Moss Vale, the train arrived at Moss Vale to be serviced. Upon arrival in Moss Vale, 3526 and the two diesels returned to Thirlmere light engine, leaving the two Pacifics to return to Central alone. In a surprise move, the mighty 38 was put into the lead for the run home, and the two locomotives provided some truly dramatic scenes in the chill afternoon air – scenes taken straight from a historical photo or video, perhaps. Although no trace of the original station remains, Yanderra (located 109km south of the buffers at Sydney Terminal) is a very popular destination for photographers chasing trains along the main south line. When I heard about the new lease units for Locomotive Demand Power (a division of Downer EDI Rail) making their first trip to Melbourne at the head of QRNationals 3BM7 service, I began thinking about locations to get the shot from, and settled on Yanderra, despite it being a 4km walk from Bargo Station. In the rain. With QRNational recently running up to three hours or more ahead of their normal path on the Main South, I made the decision to arrive early, and (after getting lost from misreading a map) arrived at 10:25. As I was walking up to the station (along my impromptu and undesirable detour via the back roads of Yanderra – the town only has five roads or so! ), I heard a late running 3MB7 roar through behind triple bulldogs. Despite having seen this before, who knows how much time such movements have left, with these new units coming online very quickly. The first (seen, rather than just heard) movement would be a northbound 2XW4 SteelLink service, through at 11:25, behind solo NR6. With ARTC workers on the line between Yanderra and Bargo, NR6 announced it’s arrival with a blast from the horn, before running over detonators on the line south of Yanderra (close to Yerrinbool). It would not prove to be an issue to hear trains coming from the south. LDP001/LDP002 leading QRNationals 3BM7 freighter south through Yanderra. Shortly after the sound of NR6 and it’s train was lost beneath the noise from the nearby Hume Highway, another horn was heard, followed by the familiar “crump, crump” of detonators. It would prove to be 8132 hauling 2134 cement north, rolling past at 11:37. It would be another hour before another pair of detonators were set off to the south, and this heralded the arrival of NR115/NR62/NR23 with a late running 1PS6 intermodal at 12:34. 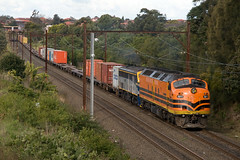 Unlike the short (and empty) steel train earlier, this mammoth train (Perth – Sydney freights can be up to 1.8km long) was fully loaded with containers (as well as other intermodal loading, such as steel, timber and paper), as well as three Sadliers louvre vans, bound for the Sadliers depot at Cooks River. As time marched closer to the expected arrival time of 3BM7 (approx 13:30 to 14:00), the familiar bark of GM locomotives could be heard to the north, certainly not the noise expected from brand new EMD units! Imagine my surprise to see HL203/T385/T373/GM36 racing south with EL Zorros 1391 container service from Botany to Junee at 13:26! Finally, at 13:38, LDP001 and 002 eased around the bend to the north of the bridge, and continued their journey south, with CLP10, G534 and G516 dead attached. The two LDP Class would arrive into Melbourne late that night, their entire journey between Broadmeadow and Dynon tracked by enthusiasts from all over the east coast. LDP001 and LDP002 are scheduled to return to Sydney on Friday 13/2 at the head of 5MB7, normally into Sydney just after morning curfew ends.